Bill Clinton served as the 42nd President of the United States. 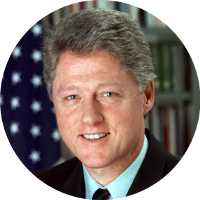 Prior to being elected President, Bill Clinton was the 40th and 42nd Governor of Arkansas. He also served as the Arkansas Attorney General. After graduating from Georgetown University, Bill Clinton won a Rhodes Scholarship to attend the University of Oxford. However, he left Oxford before graduating to attend Yale Law School where he met his wife Hillary (Rodham) Clinton. President Bill Clinton does not currently have any known famous kin. His known ancestors are predominantly Southern and mid-Atlantic. Hopefully some famous kin of President Clinton’s will be identified in the future.